Chuck Greene, father, former motocross superstar and survivor of a zombie outbreak in Las Vegas two years after the events in Willamette (chronicled in Dead Rising), is participating in Terror Is Reality XVII a pay-per-view television event centered around the wholesale slaughter of the undead. This vulgar competition is taking place in the newly built Fortune City, Nevada, billed as America's playground and filled with vice and temptation. When an explosion occurs shortly after the show, zombies overrun the city and Chuck -- along with a zombie advocacy group CURE (Citizens for Undead Rights and Equality) -- is framed for what has been deemed a terrorist act. Now Chuck has three days to find evidence to prove his innocence before the military arrives to evacuate survivors, all while keeping his infected daughter supplied with the zombie inhibitor Zombrex. Oh, and dealing with the thousands of undead shambling about. Chuck Greene is having what is, by any standard, a bad week. 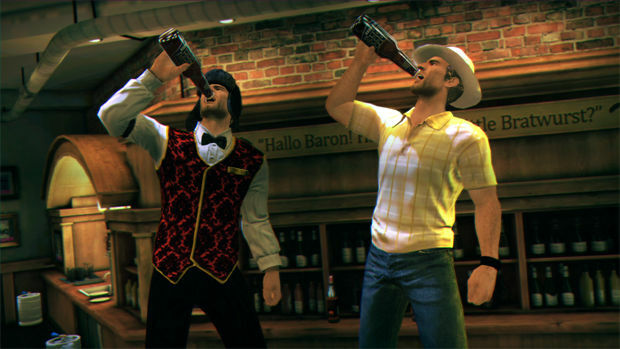 Dead Rising 2 features an entertaining story, if somewhat predictable. Chuck is a compassionate, sympathetic character that's easy to become attached to. That attachment is aided in no small part by the relationship with his daughter, Katey, to whom Chuck must administer Zombrex every 24 hours. The cutscenes centered around this activity shed light on their shared history and on Chuck as an individual, and pull the player into the story wonderfully. It's clear that Capcom made an effort to create a believable atmosphere and a serious tale in the scenes which drive the plot forward, but that's about all it takes seriously. Throughout the city are other survivors whose situations and motivations are often utterly ridiculous and quite funny. Tongue-in-cheek humor that serves both as entertainment and commentary on American culture is pervasive in Fortune City, from the over-the-top Terror Is Reality game show and posters for high-octane films like Revenginator 7 to the zombies still lining up at the slot machines even in undeath. For the most part, it works well enough. Some characters, such as the safe house security guard Sullivan, feel a little bit forced in the voice acting. But most are surprisingly natural, a huge surprise from the company which generally delivers hammed dialog and acting as in the Resident Evil series, and this title's predecessor. Meanwhile, the humor consistently hits the mark and there are plenty of tiny jokes littered throughout the world to discover. 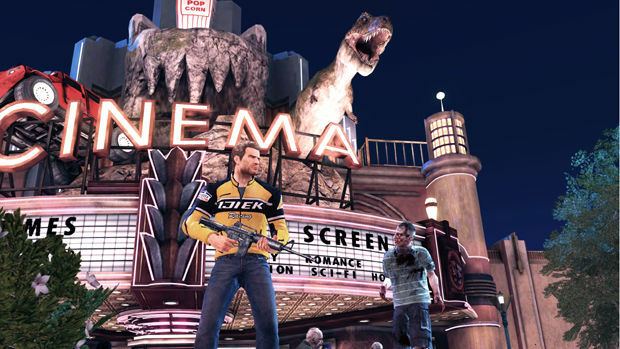 Graphically, Dead Rising 2 is solid but nothing particularly special. Textures occasionally pop in very obviously, noticeable whenever you travel faster than Chuck's natural running speed. And it does have some infrequent framerate issues where the game slows to an utter crawl. These issues are understandable when you consider just how much stuff exists everywhere in the massive world, but they are present and mildly annoying nonetheless. At the start of the game, Chuck is not the most effective survivor you'll ever meet. As you kill zombies and explore Fortune City, you'll earn Prestige Points (PP) which go towards increasing his experience level. New levels bring an assortment of rewards, such as additional health, speed, increased inventory capacity and damage bonuses. You'll also learn a series of combat abilities which will become crucial to your survival, including melee attacks and the all-important dodge roll. As a result of this progression, the game can be a touch on the frustrating side at the outset. Chuck's levels build quickly early on and you'll definitely notice the changes in him as levels progress. Eventually, he does become a machine of zombie destruction, but it takes time, much more than the game's eight hour running time allows for. You can, however, restart the story at any time, taking your earned experience levels, money, and unlocked items with you. That's simply how the game is meant to be played. It's certainly possible to progress through the entire story from start to finish without ever taking advantage of the restart feature, and such an endeavor would provide quite a bit of challenge. 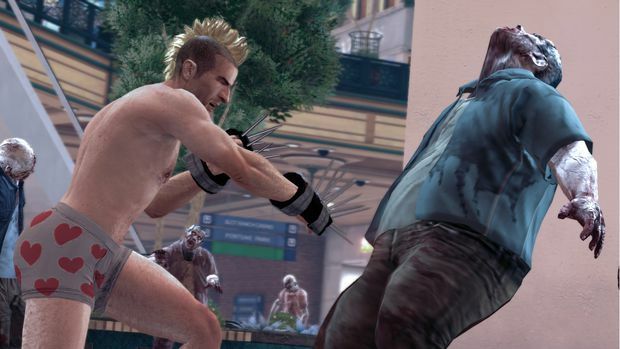 But the spirit of Dead Rising 2 is in trial-and-error gameplay, and accomplishing all of Chuck's tasks will require you to plan ahead and manage your time effectively. Besides, there are few things more satisfying than obliterating everything in your path after working hard to attain the maximum experience level. New players would be advised to ignore the story for the first few hours while they play and experiment in Fortune City, earning a few levels along the way. And that's very easy to do. Fortune City is a huge environment, featuring two shopping centers, an arena, a hotel and multiple casinos. Connecting them all is a vast courtyard area and an underground series of maintenance tunnels. These locales are broken up into eleven large regions, with additional smaller areas for the rooftops of certain buildings. All of these are filled with weapons, equipment, interactive objects and, of course, zombies. The environments truly are amazing, with a staggering amount of things to interact with. Almost every section has some kind of special environmental object which functions as a mini-game, often rewarding Chuck with money and other rewards. But everything packed into them comes at a significant cost. Traveling between regions, as you'll do constantly, results in a rather lengthy loading time. It's not hard to feel like you spend half of your time outside of the game, staring at a static screen while you wait for the action to start again. Just about anything Chuck can pick up can be used as a weapon. Baseball bats and axes are obvious tools of destruction, but other items such as a stuffed moose head or a park bench can be wielded as well. Many weapons have two modes of attack, performed by either tapping or holding the attack button, to provide more versatility. Beyond basic weapons, Chuck is a bit of a handyman and can create weapons at maintenance rooms liberally sprinkled throughout the map. Items which can be used to make these combo weapons are designated with a wrench icon and they are generally the most effective zombie-slaying tools in the game. Not only can most of them completely tear apart an oncoming horde, using them also provides bonus PP to help Chuck gain experience faster. Discovering a combo weapon on your own rewards you with a "Scratch Card" which gives you the formula used in its creation. "Combo Cards" -- earned by rescuing survivors, gaining experience levels and more -- offer improved versions with greater durability and double the PP rewards. The entire system of combo weapons is an awesome addition to the game. Experimenting both with their creation and application is great fun. Building combo weapons is not the only way to acquire them. They may also be purchased from the four pawn shops set up by looters within Fortune City. These shops offer a range of merchandise from generally useless gag items to highly valuable -- and expensive -- unlockable items. Cash to purchase these items with is practically everywhere in the game, whether it be sitting on the ground, liberated from ATMs or earned in games of skill and chance. To find the evidence which will exonerate Chuck, you'll have to be in the right places at the right times. A series of "Case" missions which will slowly reveal the truth of what has happened take place at specific times during the three days in Fortune City. Players of Dead Rising will already be familiar with the mechanic and if you didn't care for the manner in which the game forced you to follow its script or hate being interrupted, you probably won't like it any better now. To its credit, the missions do feel as though they have a better pace to them in this sequel, allowing plenty of time to accomplish tasks elsewhere and still make it back to give a dose to Katey or start the next sequence of events. And, of course, you are free to not bother with the Case missions at all and simply slaughter zombies, though missing one of them cancels those remaining. This is not without its flaws, particularly if you have restarted the story after you become aware that certain events will transpire eventually. Because they might not. Areas that should become opened regardless of whether or not Chuck carries out his role in the story never will be if he is not involved, completely destroying the illusion that the world has any life of its own. It shouldn't be an issue for first-timers and players who decide to skip out on the story for a run will be mildly inconvenienced at worst, but the effect remains present. Chuck's eyes in Fortune City are provided by CURE chapter leader Stacey Forsythe who, monitoring surveillance cameras from the safe house, provide him with information on the location of survivors and gives reminders of important events using a transceiver. One of the major complaints from the first game was the manner in which similar calls would interrupt gameplay, forcing you to wait for the text of the entire conversation to appear on screen and any interruption would start the entire process over. Now, these messages can be easily progressed through with a quick button press, making the mechanic significantly less obtrusive. Second only to the story-related missions, rescuing the survivors of Fortune City is one of Chuck's most important tasks. Just as with the Case missions, survivors are only present in specific areas at certain times on certain days, and you'll have to plan in order to save them all. Some of these survivors will simply join up with Chuck as soon as he meets them, but many have conditions which will need to be met before they'll accompany him. These conditions usually require Chuck to give them an item, though some require the presence of other, specific survivors or have other, more unique requirements. Also, not all of the survivors will be seen by Stacey, so exploring the world to find them is the only way you'll ever know that they are there. Once in your party, survivors can be directed to either follow Chuck or wait in a location you designate. They are surprisingly hearty, and capable of taking more than a few hits from zombies (or friendly-fire) before being killed. They are also rather capable fighters and can be equipped with many of the game's multitude of weapons. 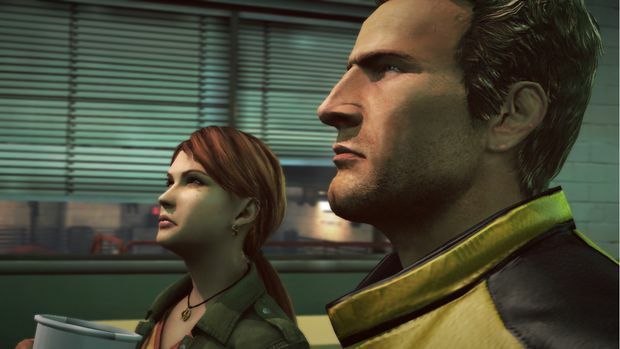 Far from the burden they were in the original Dead Rising, survivors can now be a valuable asset when accompanying Chuck, making them fun to have around. Bringing them back to the safe house offers huge rewards, including large quantities of PP and other bonuses -- such as valuable doses of Zombrex -- offering plenty of motivation to seek them out. Not every survivor is going to be Chuck's friend, however. Some of these individuals have had their minds broken by the chaos erupting around them and are now dangerous killers. The "psychopath" class of survivors act as mini-boss encounters and are typically well-armed, fast-moving and capable of taking a serious beating before they go down. While it's easy to say that these encounters are "broken" or otherwise unfair, the fact is that they just require a completely different approach than dealing with the zombies. Fighting a psychopath means taking full advantage of the environment in which you fight and coming in prepared to deal with them is a must. This, again, goes back to Dead Rising 2's gameplay aesthetic being focused on trial-and-error. It may be frustrating to deal with the psychopaths, but the satisfaction of finally emerging victorious from a difficult encounter is sweet indeed. That said, combat with psychopaths clearly demonstrates some deficiencies in the game's mechanics. Chuck is rather slow, even at his best, and contact with just about anything can interrupt an attack animation. Add in that distance seems to have little or no effect on all but a few ranged weapons (which are used by many, many psychos) and you have a recipe for disaster. Patience, planning and persistence can eventually win the day but you will face no small amount of consternation when it comes to these enemies. Finishing the main game doesn't necessarily mean that you're finished, either. 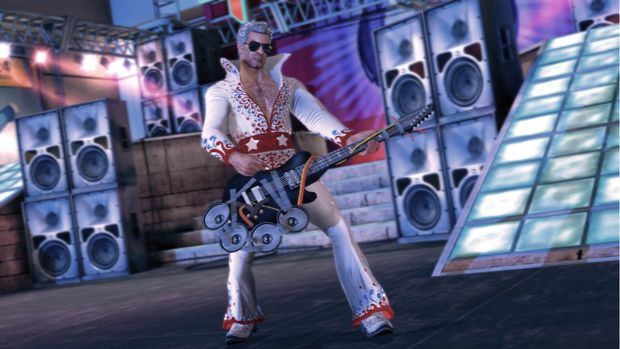 The trophies/achievements in Dead Rising 2 are expansive challenges, requiring you to use every item, every weapon and try on every alternate costume. 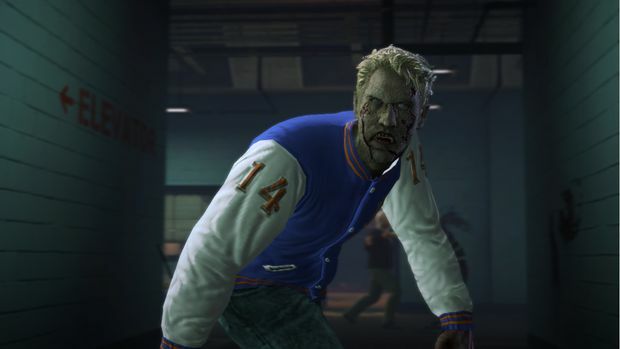 The "Zombie Genocider" goal of killing 53,596 zombies from Dead Rising returns and the ante is upped further with an additional award if you can succeed in killing a whopping 72,000 undead. A completionist's dream, the amount of replay value is staggering and those who want to accomplish it all will have a lot of work to do. 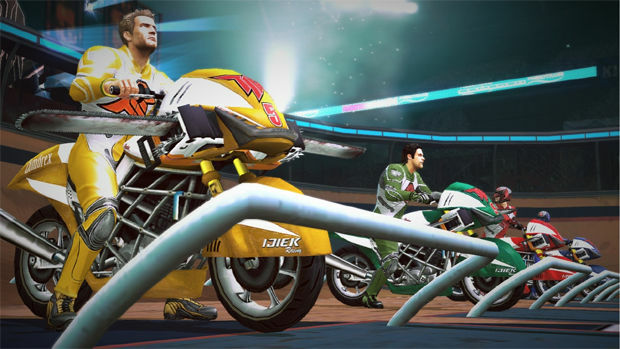 In addition to the main game, Dead Rising 2 features two multiplayer modes. A drop-in/drop-out cooperative mode has been implemented, allowing a second player to join a game over the internet. When someone wants to join your game, the transceiver will ring and a quick button press brings them right into the action. Playing with a second Chuck Greene in the world makes everything easier, particularly psychopath fights where the enemies will have a second target to focus fire on. The co-op works well from a technical standpoint, but playing in a public game in which anyone may join can lead to a bit of annoyance if the other player does not share your agenda. It's fine when all you want to do is muck about killing zombies and earning PP. But if you're pursuing the completion of missions, it's entirely likely that the random person joining your game is not going to be interested and can impede your progress. Both players must be present at the exit to a new locale in order to leave, meaning that you may have to kick your partner from the game should they decide to do their own thing. If you don't want to deal with receiving game requests, your game can be set to private from the options menu. A versus mode is also present, called Terror Is Reality. This competitive game for four players is based around the competition of same name which Chuck participates in during the single-player game and features nine party-style events. Each round consists of four events, set in combinations which allow for a consistent level of potential scoring on the leaderboards. There's a little something for everyone in them, from the asset management of "Headache," in which you put blenders on the heads of zombies to rack up points, to the sniping game, "Bounty Hunter." And every round ends with a game of "Slicecycles," where players ride motocross bikes armed with chainsaws through the arena. It's very rare that I become enamored of a competitive multiplayer game (as I am not overly competitive myself), and I often find that the repetition of most shooters and other popular genres for the form to wear me out. 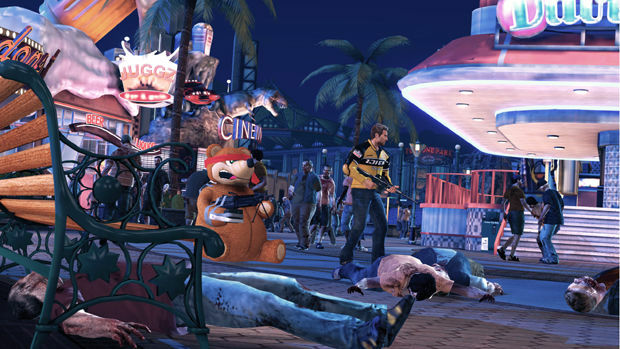 Dead Rising 2's versus offerings, however, are great fun with enough variety to keep players of all types entertained and competitive. As an added bonus, all points earned in Terror Is Reality can be converted into cash that you can take with you into you solo game, making it one of the fastest ways to earn the more expensive unlockable items in the pawn shops. It's also worthwhile to make note of the announcers who commentate on games of Terror Is Reality. Taking a page out of Madworld, these voice-overs add puerile and base humor to the proceedings. Much of their dialog is groan-worthy, but there are some real gems in their comments and a fair bit of variety. You'll quickly grow weary of their comments in all-too-frequent rounds of Slicecycles. On the plus side, they are easy to ignore. Terror Is Reality does suffer from some issues in its netcode. Games of "Ramsterball" inexplicably experience serious lag from time to time and can make it nearly unplayable. Oddly, the other games rarely experience these same difficulties, even after you've had problems in that event. Getting into a game may make you wait a fair bit of time also, if it even gets other players at all (the Xbox 360 version of the game reportedly has serious problems with this, though this reviewer has had rare issues of that nature playing the PS3 release). 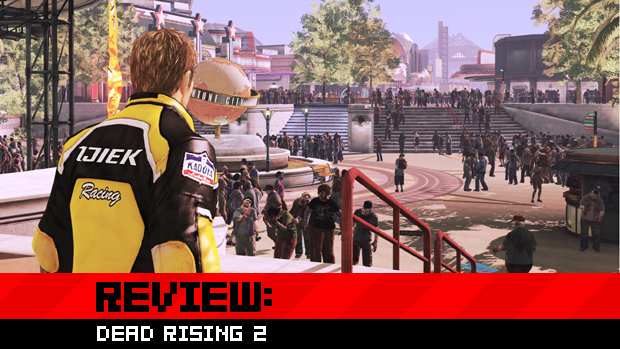 Between the solid story, entertaining gameplay and huge replay value, Dead Rising 2 offers more bang for your buck than just about any single-player game on the market right now. Add in the multiplayer features and you have a great package. The design, however, is an acquired taste and simply will not be everyone's cup of tea. But for those out there who can appreciate an action game where the prevailing philosophy is one of planning and foresight, while forgiving its flaws, it is an exceptional treat to play.